New York, NY, December 1, 2017 — Bill Moyers, a legend in broadcast journalism for four decades, has been selected as the 2018 Justice Media Trailblazer, an award given annually by the John Jay College of Criminal Justice and The Crime Report to honor individuals in the media or media-related fields who have advanced national understanding on the 21st-century challenges of criminal justice. 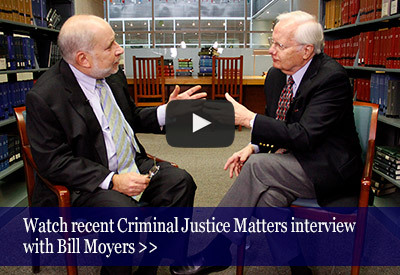 Most recently, Moyers was the executive producer of Rikers: An American Jail. The riveting documentary brings viewers face to face with men and women who have endured incarceration at the country’s largest jail facility. Their stories, told directly to the camera, vividly describe the cruel arc of the Rikers experience—from the shock of entry, to the extortion and control exercised by other inmates, the oppressive interaction with corrections officers, the torture of solitary confinement, and the challenges of reentering civil society. RIKERS, which won a 2017 Robert F. Kennedy journalism award, is a production of Schumann Media Center, Inc. and Brick City TV LLC, in association with Public Square Media, Inc.
“Bill Moyers has been honored in many venues for his journalism, but the John Jay Trailblazer award is a way of recognizing the impressive contribution he has made in bringing longstanding issues of incarceration to the forefront at this time in our history, and in setting a standard of excellence for other journalists writing on criminal justice,” said Stephen Handelman, Executive Editor of The Crime Report. Moyers, who began his television career in 1971 after serving as deputy director of the Peace Corps and special assistant and press secretary to President Lyndon B. Johnson, has been responsible for groundbreaking public affairs series, such as NOW with Bill Moyers (2002-05), Bill Moyers Journal (2007-10) and Moyers & Company (2011-15). Among his many honors, he has won 36 Emmys and 9 Peabody Awards. Moyers, the fifth recipient of the annual Justice Media Trailblazer, will receive his award during a dinner on the evening of February 15, 2018 at John Jay College, which will also recognize the winners of the annual 2017-2018 John Jay/Harry Frank Guggenheim Prizes for Excellence in Criminal Justice Journalism, who will be announced in January, 2018. The dinner is the highlight of the 13th annual John Jay/H.F. Guggenheim Symposium on Justice in America. Previous Trailblazers were: Van Jones of CNN; David Simon of The Wire; Piper Kerman, author of Orange is the New Black; NPR's Maria Hinojosa, producer of Latino USA; and New Yorker writer Jelani Cobb. Former New York State Chief Judge Jonathan Lippman will introduce Moyers at the dinner, which will be emceed by NY 1 News anchor Errol Louis and hosted by John Jay College President Karol V. Mason.